New figures released by Social Justice Ireland today show 100,000 more people are in poverty than at the start of the recession. THE NUMBER OF people living in poverty in Ireland has increased by more than 100,000 since the onset of the recession – meaning that 750,000 people in Ireland currently live in poverty. The figures are a “major concern” for the country, according to Social Justice Ireland (SJI), which released a new policy document on the issue today. It wants government to tackle the issue of poverty in Ireland by bringing in new initiatives such as making tax credits refundable and supporting the adoption of a living wage. Almost one in five children live in households with incomes below the poverty line. Most weekly social assistance rates paid to single people are €30 below the poverty line. SJI says that most European studies, including those carried out by the CSO, the poverty line is “at 60% of median income, adjusted to take account of family size and composition”. According to the Central Statistics Office (CSO), the median disposable income per adult in Ireland during 2014 was €18,210 per annum or €349.98 per week. This would mean that, based on the 2014 figure above, the 60% of median income poverty line for a single adult was €209.39 per week. When the figures are updated to 2016 levels, using published CSO data on the change in average earnings in 2015 (+2.1%) and ESRI projections for 2016 (+2.0%) produces a relative income poverty line of €218.06 for a single person. 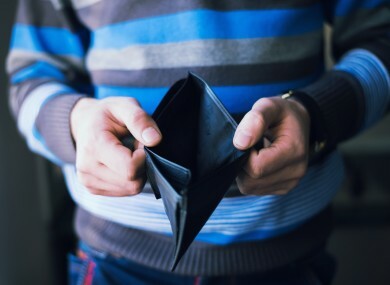 More than 57% of those in poverty are not connected to the labour market; they are people who are retired, students, people in caring roles or people who are ill or people with a disability. He told TheJournal.ie that almost one in five of those who are living in poverty are people with jobs. Social welfare was described by SJI as being of critical importance in addressing poverty. “Without social welfare payments more than half of Ireland’s population would be living in poverty; such an underlying poverty rate suggests a deeply unequal distribution of income,” pointed out Michelle Murphy, research and policy analyst at SJI. The document also highlights the gap in income between Ireland’s rich and poor. If the government wants to close the divide, future policy “must prioritise those at the bottom of the income distribution”, said Michelle Murphy. Set a goal of eliminating poverty in the course of one Dáil term. Introduce a full Basic Income system – to replace the parts of the social welfare system that are no longer fit for purpose. Ensure equity of social welfare rates, to stop the discrimination against certain groups on a basis such as age. Support the widespread adoption of the Living Wage so that inequality can be reduced and low-paid workers receive an adequate income and can afford a minimum, but decent, standard of living. Make tax credits refundable, to eliminate poverty among people with low-paid jobs. Introduce a universal state pension. Introduce a cost of disability payment, to ensure that people with disabilities are not driven into poverty by the additional cost of their disability. Email “750,000 people are living in poverty in Ireland - on under €218 a week”. Feedback on “750,000 people are living in poverty in Ireland - on under €218 a week”.